Hidden Markov Models (HMM) are stochastic methods to model temporal and sequence data. They are especially known for their application in temporal pattern recognition such as speech, handwriting, gesture recognition, part-of-speech tagging, musical score following, partial discharges and bioinformatics. This code has also been incorporated in Accord.NET Framework, which includes the latest version of this code plus many other statistics and machine learning tools. Hidden Markov Models were first described in a series of statistical papers by Leonard E. Baum and other authors in the second half of the 1960s. One of the first applications of HMMs was speech recognition, starting in the mid-1970s. Indeed, one of the most comprehensive explanations on the topic was published in “A Tutorial On Hidden Markov Models And Selected Applications in Speech Recognition”, by Lawrence R. Rabiner in 1989. In the second half of the 1980s, HMMs began to be applied to the analysis of biological sequences, in particular DNA. Since then, they have become ubiquitous in the field of bioinformatics. Dynamical systems of discrete nature assumed to be governed by a Markov chain emit a sequence of observable outputs. Under the Markov assumption, it is also assumed that the latest output depends only on the current state of the system. Such states are often not known from the observer when only the output values are observable. Hidden Markov Models attempt to model such systems and allow, among other things, (1) to infer the most likely sequence of states that produced a given output sequence, to (2) infer which will be the most likely next state (and thus predicting the next output) and (3) calculate the probability that a given sequence of outputs originated from the system (allowing the use of hidden Markov models for sequence classification). 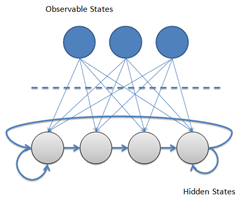 The “hidden” in Hidden Markov Models comes from the fact that the observer does not know which state the system may be in, but has only a probabilistic insight on where it should be. Hidden Markov Models can seem as finite state machines where for each sequence unit observation, there is a state transition and, for each state, there is an output symbol emission. Given the parameters of the model, compute the probability of a particular output sequence. This requires summation over all possible state sequences, but can be done efficiently using the Forward algorithm, which is a form of dynamic programming. Given the parameters of the model and a particular output sequence, find the state sequence that is most likely to have generated that output sequence. This requires finding a maximum over all possible state sequences, but can similarly be solved efficiently by the Viterbi algorithm. Given an output sequence or a set of such sequences, find the most likely set of state transition and output probabilities. In other words, derive the maximum likelihood estimate of the parameters of the HMM given a dataset of output sequences. No tractable algorithm is known for solving this problem exactly, but a local maximum likelihood can be derived efficiently using the Baum-Welch algorithm or the Baldi-Chauvin algorithm. The Baum-Welch algorithm is an example of a forward-backward algorithm, and is a special case of the Expectation-maximization algorithm. The solution for those problems are exactly what makes Hidden Markov Models useful. The ability to learn from the data (using the solution of problem 3) and then become able to make predictions (solution to problem 2) and able to classify sequences (solution of problem 2) is nothing but applied machine learning. From this perspective, HMMs can just be seem as supervisioned sequence classifiers and sequence predictors with some other useful interesting properties. Choosing the structure for a hidden Markov model is not always obvious. The number of states depend on the application and what interpretation one is willing to give to the hidden states. Some domain knowledge is required to build a suitable model and also to choose the initial parameters that an HMM can take. There is also some trial and error involved, and there are sometimes complex tradeoffs that have to be made between model complexity and difficulty of learning, just as is the case with most machine learning techniques. The solution to the three canonical problems are the algorithms that make HMMs useful. Each of the three problems are described in the three subsections below. The first canonical problem is the evaluation of the probability of a particular output sequence. It can be efficiently computed using either the Viterbi-forward or the Forward algorithms, both of which are forms of dynamic programming. The Viterbi algorithm originally computes the most likely sequence of states which has originated a sequence of observations. In doing so, it is also able to return the probability of traversing this particular sequence of states. So to obtain Viterbi probabilities, please refer to the Decoding problem referred below. The Forward algorithm, unlike the Viterbi algorithm, does not find a particular sequence of states; instead it computes the probability that any sequence of states has produced the sequence of observations. In both algorithms, a matrix is used to store computations about the possible state sequence paths that the model can assume. The forward algorithm also plays a key role in the Learning problem, and is thus implemented as a separate method. ///   Calculates the probability that this model has generated the given sequence. ///   either the Viterbi or the Forward algorithms. ///   A sequence of observations. ///   the likelihood. Default is false. ///   The probability that the given sequence has been generated by this model. The second canonical problem is the discovery of the most likely sequence of states that generated a given output sequence. This can be computed efficiently using the Viterbi algorithm. A trackback is used to detect the maximum probability path travelled by the algorithm. The probability of travelling such sequence is also computed in the process. ///   that produced the given observation sequence. ///   using the Viterbi algorithm. /// <param name="observations" />A sequence of observations. /// <param name="probability" />The state optimized probability. The third and last problem is the problem of learning the most likely parameters that best models a system given a set of sequences originated from this system. Most implementations I've seem did not consider the problem of learning from a set of sequences, but only from a single sequence at a time. The algorithm below, however, is fully suitable to learn from a set of sequences and also uses scaling, which is another thing I have not seen in other implementations. The source code follows the original algorithm by Rabiner (1989). There are, however, some known issues with the algorithms detailed in Rabiner's paper. More information about those issues is available in another section of this article entitled “Remarks”. ///   Runs the Baum-Welch learning algorithm for hidden Markov models. ///   HMM parameters M = (A, B, pi) that best fit training data. ///   likelihood respecting the desired limit. ///   An array of observation sequences to be used to train the model. ///   specified by the previous parameter. ///   The average log-likelihood for the observations after the model has been trained. // emissions as training data. //    of the entire string goes up, and this value can then be made the new value of the transition. //            backward probability for each HMM state. //            and dividing it by the probability of the entire string. // avoid locking a parameter in zero. For us, it can be obvious to see that the system is outputting sequences that always start with a zero and have one or more ones at the end. But let's try to fit a Hidden Markov Model to predict those sequences. Of course, the model performs well as this is a rather simple example. A more useful test case would consist of allowing for some errors in the input sequences in the hope that the model will become more tolerant to measurement errors. We can see that despite having a very low probability, the likelihood values for the sequences containing a simulated measurement error are greater than the likelihoods for the sequences which do not follow the sequence structure at all. In a subsequent article, we will see that those low values for the likelihoods will not be a problem because HMMs are often used in sets to form sequence classifiers. When used in such configurations, what really matters is which HMM returns the highest probability among others in the set. A practical issue in the use of Hidden Markov Models to model long sequences is the numerical scaling of conditional probabilities. The probability of observing a long sequence given most models is extremely small, and the use of these extremely small numbers in computations often leads to numerical instability, making application of HMMs to genome length sequences quite challenging. There are two common approaches to dealing with small conditional probabilities. One approach is to rescale the conditional probabilities using carefully designed scaling factors, and the other approach is to work with the logarithms of the conditional probabilities. For more information on using logarithms, please see the work entitled “Numerically Stable Hidden Markov Model Implementation”, by Tobias P. Mann. The code on this article is based on the Tutorial by Rabiner. There are, however, some problems with the scaling and other algorithms. An errata depicting all issues is available in the website “An Erratum for ‘A Tutorial on Hidden Markov Models and Selected Applications in Speech Recognition’” and is maintained by Ali Rahimi. I have not yet verified if the implementation presented here also suffers from the same mistakes explained there. This code has worked well under many situations, but I cannot guarantee its perfectness. Please use at your own risk. Thanks to Guilherme C. Pedroso, for the help with the Baum-Welch generalization for multiple input sequences. He has also co-written a very interesting article using hidden Markov models for gesture recognition, entitled “Automatic Recognition of Finger Spelling for LIBRAS based on a Two-Layer Architecture” published in the 25th Symposium On Applied Computing (ACM SAC 2010). L. R. Rabiner, "A Tutorial on Hidden Markov Models, and Selected Applications in Speech Recognition," Proc. IEEE, Vol. 77, No. 2, pp. 257--286, Feb. 1989. Warakagoda, Narada D., “A Hybrid ANN-HMM ASR system with NN based adaptive preprocessing”, Norges Tekniske Høgskole, 2006. A. Rahimim, “An erratum for: A tutorial on hidden Markov models and selected applications in speech recognition”, World Wide Web. Available in: http://xenia.media.mit.edu/rahimi/rabiner/rabiner-errata/rabiner-errata.html. Wikipedia contributors, "Hidden Markov model," Wikipedia, The Free Encyclopedia, http://en.wikipedia.org/wiki/Hidden_Markov_model (accessed March, 2010). How can i use this framework to clustering with EM algorithm? So my question is are there any example to use EM algorithm with this framework? Re: How can i use this framework to clustering with EM algorithm? Yes, it is possible to use the framework to perform clustering with GMMs. For example, you can use the GaussianMixtureModel class as detailed in the bottom of the documentation page[^]; or you can also download the GMM sample application[^] to see how 2D points can be clustered using this same algorithm. I am new to HMM. first of all nice code and documentation, it helped me to understand HMM better. however I have some questions on states. in the spreadsheet, rows 5,6 & 7 have three different digits/Events in sequence. 1)how to decide that states outcome is 2, and not 3? 2)is it because the output is has higher probability to be either 2 out of the 3 classes? 3)if so, could I increase states according to the probability percentage, instead of hard coded? example, if all 3 distinct values have equal support of (33.33%), states will be set to 3. I was looking through the evaluation function and started to wonder what actually happens when you calculate the probability of the model generating a sequence of symbols. For me, it seems natural to use the alpha variable as defined by the forward algorithm, and add the value of the alpha variable for each state, with t = (length of sequence). Instead, it seems like you multiply a number n of coefficients, where n is the length of the sequence. Can you help me, I am bit confused about what those coefficients mean, and how multiplying them (adding in log space) calculates the likelihood of the sequence? Thanks for the interest and for the nice feedback! However, I have to say that article is a bit outdated; it has been superseded by Sequence Classifiers in C# - Part I: Hidden Markov Models[^]. Also, the latest version of the code is also available in GitHub[^] if you would like to take a look. In any case, also please let me explain what is going on the code. One problem when evaluating hidden Markov models is that their evaluation might involve multiplying lots of very small numbers, that become even smaller as the length of the sequence grows. As such, at some point, we start getting lots of precision errors because our computer have only finite precision for double numbers. The implementation shown in the article was made using the scaling technique. This technique basically consists at, at each step of the forward algorithm, normalize the obtained probabilities so they sum up to one. However, we keep track of the normalization constants that we used at each step using the coefficients vector shown above. In the end, to get the probability of the sequence, we multiply those coefficients. This is well-known technique, but it is not the best one. That is why in the latest version of the Accord.NET Framework[^] this computation is done using log-probabilities instead. The idea is to first transform every probability in the forward matrix into the log domain, then use summations instead of multiplications at each step. This avoids getting very small numbers in the computations, and also avoids the need for normalizing at each step. Is the code somewhere available on GitHub? I would like to make some contributions improving the performance of the algorithm. First and foremost, thank you very much for the help! The latest version of the hidden Markov model modules is available in the Accord.NET Framework[^]. The project is available on GitHub, and more specifically, all the HMM-related namespaces can be found here[^]. The Baum-Welch algorithm, for example, is located here[^]. Please note that the version of the code described in this article was a bit of an early version; the version now available in the framework provides further things and has been changed a little. If you would be interested, a newer version of this article had been also published here[^]. It is more up-to-date with the HMMs available inside the framework, if you need! Since the diff is too long, I can't comment on it on GitHub. Something quite strange is that when one evaluates a sequence with length zero, the result is double.NegativeInfinity. One would expect one, since such sequence is always "represented" in the hidden Markov model, and furthermore if one uses the real probability, an exp operation should be applied on it resulting in zero. What is the rationale behind this decision? You did this in your code: B[i, observations]. If the value of "observations" is negative or its value is greater than the column size of B, we will have an error. So, why did you do this? Thanks for the interest in the code! In the discrete case, symbols can be represented by integer labels ranging from 0 to the number of symbols. For example, if you have observations "Sunny", "Cloudy", "Rain", you can easily replace them by 0, 1 and 2. And that is exactly what the HMM is expecting: a vector of integers ranging from 0 to the number of symbols. Thus, observations cannot be negative nor greater than the size of B. The number of symbols must be passed on the HMM's constructor so it can build the forward and emission matrices appropriately. However, if you really need negative observations, which may imply that your observations are not discrete or cannot be translated into a set of integer symbols, then you can use the generic version of the hidden Markov models which can accept even real-valued variables[^]. For a more detailed explanation, please also take a look at the main article I submitted some years after this one, Sequence Classifiers in C# - Part I: Hidden Markov Models[^]. I hope it helps! Each sequence represents a position in 2D, I mean (X,Y). How can I infer the estimated values of X and Y from these observations using HMM? I am a little confused all to deal with, so your help is greatly appreciated. I search Hidden markov model in C# and I found in code project. Is it using library ? Great work. I am new to the whole .net thing and im kind of lost on how to get it working. I installed the Accord.Net, Forge.Net and also SharpDevelop. So im wondering how can i import this in and get it to work? Sorry to bother u on such a simple question. But HMM has been around for a very long time. I did it during my school days using matlab but this is really intriguing. Perhaps you could take a look on Accord.NET's getting started guide[^]. It shows how to add references to some projects. For HMMs, please take a look on the newer article, Sequence Classifiers in C# - Part I: Hidden Markov Models[^]. The assemblies you are looking for are Accord.Statistics and Accord.Math. You can also download the sample project, which should come with an already working project configuration! See also Sequence Classifiers in C# with Hidden Conditional Random Fields. first of all. Thank you. Your code and article helps me a lot. But I need to ask you something. How to interpreate the result ? What the result mean ? Is that 99% vs ~92% ? And I don't get why. The given sequence is like the one from sequnces2. So why isn't it near 1 ? 1) Well a hidden Markov model is "trained" such that generating the given sequences (with which it is trained) is the most probable outcome. The Evaluate method calculates what the probability is of generating such sequence. A result is that the longer the sequence is, the less probable it is to generate the sequence, because there are more occasions where the sequence might "fail" to come with the queried one. 2) In the code you provide you both train hmm and hmm2 with the same sequence (sequences) which is quite the opposite of the queried sequences. Hi all, I'm a student. I've never used before HMM and I need an help. I'm using DTW (dynamic time warping) for recognition, but this is very slow. I work with positive and negative numbers (double) . Can I create a HMM for these value? How much states and characters I should use? For test I use only the sequence of points for HandLeft (X and Y). Yes, you can; but you have to create a continuous model based on a multivarate continuous distribution. Please take a look on the second example on the Accord.NET documentation for the Hidden Markov Classifier Learning class[^]. I hope it helps in accomplishing your task! Thanks you very much! I'm reading Hidden Markov Classifier Learning. There are a lots of interesting information. Hi all! I go back to writing for another question. I have read your link HiddenMarkovClassifierLearning but I have got a problem. Finally, I have put this double array in double for create my library sequences. I have wrote this code for HMM's learning. // and an underlying multivariate mixture of Normal distributions as density. Besides, you have not told what problem do you have when you are calling the method "Run". If it is giving something like a DimensionMismatchException or an IndexOutOfRange, then it means you are not passing the sequences of observations in the expected form. Please see if it helps. The AggregateException usually shows the actual exception which caused the issue in the InnerExceptions public property. Please take a look at it to see what it reports. But in any case, the problem should likely be the specification of the feature vectors as I mentioned. Did you try changing it to the way I suggested?